The follow-up to LG's award-winning BH100 dual-format high-definition disc player - the BH200 - has begun shipping in the US, and is expected to reach the UK during the first quarter of 2008. LG is unable to provide a price at present, but has confirmed to Tech.co.uk that it will be lower than the launch price of the current version, which in real terms means a reduction on the £700-odd that the BH100 currently sells for. If you were thinking of snapping up a BH100 in the January sales, our advice is to hold tight for a bit. Known colloquially as the ' Super Blu Player', the primary strength of the BH200, like its predecessor, is its ability to play both Blu-ray Discs and HD DVDs. However, the new model comes with a number of not insignificant improvements. The most notable of these, especially for serious film buffs, is that the BH200 is able to play the 'extra features' content that usually comes bundled with most HD DVD film titles. The BH100 was unable to access this extra content. With full network capability, it can also access web-connected content for some discs, such as up-to-date director commentaries or production videos. 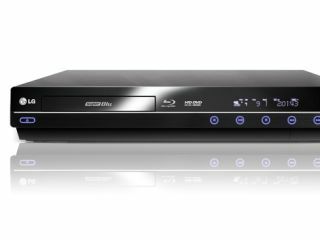 Over on the Blu-ray side of things, the BH200 features 'BD Standard Profile' and is also ready for 'BD Profile 1.1' (upgradeable to 2.0 via Ethernet) when Blu-ray discs sporting the new profile become available next year. This will enable Blu-ray viewers to use new interactive viewing features such as picture-in-picture, thereby enhancing the overall viewing experience. Besides its numerous skills with the two leading hi-def formats, the BH200 is also able to breathe new life into standard DVDs, with the ability to upscale standard DVDs to Full HD 1080p. It can even play audio CDs - something the BH100, for all its strengths, couldn't. Tech.co.uk spoke to Daniel Aziz, marketing manager for Digital Media at LG Electronics, who told us that the BH200 really is the three-in-one solution it appears to be. "The BH200 is a significant step forward, and gives consumers the freedom to pick a film title, irrespective of its format, safe in the knowledge that they'll be able to play it."